It is with great excitement that Fossil brand announces its fourth generation of smartwatches under its Fossil Q line. 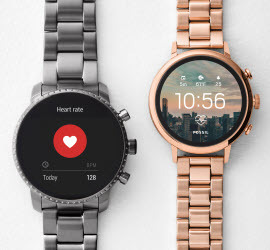 With several new technology features, this new line provides consumers with the tech functionality they have been asking for in beautiful designs and styles they have come to expect from Fossil. With a robust list of new features, it is the brand's intent to provide customers with one all-inclusive device—both in function and design. As one of the first fashion brands to introduce this level of technology to their collection, Fossil shows consumers you don’t have to sacrifice fashion for function. Powered with Wear OS by Google and the Qualcomm® Snapdragon Wear™ 2100 Platform, the new devices offer enhancements to every facet of the day, with hardware including Heart-Rate Tracking, NFC, Untethered GPS and Swimproof Functionality. Thanks to optimized charge time, users can now charge their device within an hour to last all day. Fossil entered the smartwatch market to fill the growing desire for tech that was beautifully designed and could be personalized. This new generation is no different: it is packed with the unique design traits allowing users to customize from strap to dial. There are 36+ exclusive dials, from fashion forward to novelty dials, and users can integrate an increasing number of third party apps to their device experience, as well as set social media photos as watch face backgrounds. Fossil is continuing to design smartwatches as only Fossil can, with a vintage-inspired approach to modern technology that lets customers find a watch that perfectly suits their authentic selves. Called Fossil Q Venture HR and Fossil Q Explorist HR, these devices can transition through all parts of daily life thanks to added functionality packed into fashionable designs. This new generation of smartwatches ushers in a more holistic user experience from a Fossil smartwatch with key features and personalization options that consumers care about. This watch retails for $255-$275.